Disclaimer: We are not tax experts, and these numbers are not guaranteed to be 100% accurate. Additionally, April arrivals and JETs coming in at different times of the year will pay a different amount. The information contained in this website is for general information purposes only. The information is provided by current and former JETs and while we endeavour to keep the information up to date and correct, we make no representations or warranties of any kind, express or implied, about the completeness, accuracy, reliability, suitability or availability with respect to the website. Any reliance you place on such information is therefore strictly at your own risk. All JET program participants are liable for paying Japanese taxes, however exactly how you pay your taxes will depend on your specific contracting organization. Here is a little guide to help you better understand how taxes work in Japan. 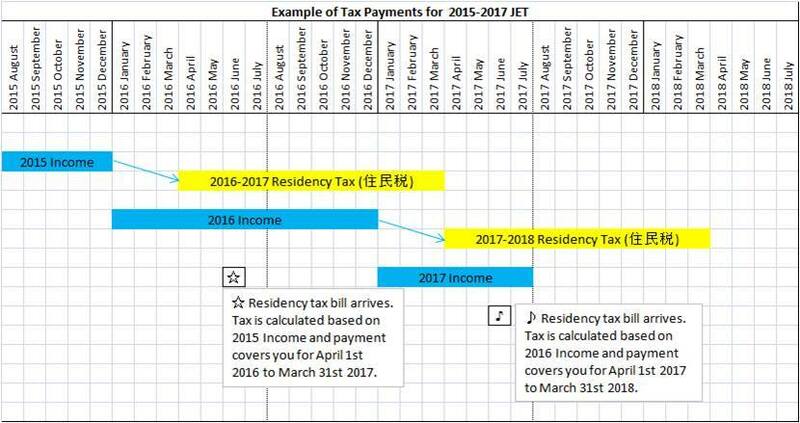 The residency tax is applied to everyone living in Japan on January 1st of that year, and the amount is based on the previous calendar year’s income. The bill for the residency tax is sent out in June. If this sounds complicated, the following chart (stolen from the amazing Oita JET website) should help explain this. So in the chart, a JET arrives in July, 2015. They work until January 1, 2016 at which point the residency tax is applied to them. That tax is based on their income during 2015, and the bill for that tax is sent out in June, 2016. They re-contract, and since they were working the entirety of 2016, the residency tax will be higher their second year. As JETs normally only work for 5 months their first year, the tax bill is lower than other years. Since American ALTs are exempt from taxes for their first two years, they will begin paying taxes in their third year. Their income will be taxed from the start of their third year, meaning that they will only pay taxes on five months of salary. Income taxes will be automatically taken out of your paycheck every month, and will be between ¥5,000 – ¥8,000. How do we Pay these Taxes? Income tax will automatically be withdrawn from your paycheck every month. Residency tax: Your contracting organization will decide how you pay it. Some COs will withdraw money every month to cover the tax, and some will ask you to pay it yourself when the bill comes in June (you should be able to pay these at convenience stores). Confirm with your CO how you will be paying the tax soon after arriving in Japan to avoid being caught off guard with a huge bill come June. When you do finish your time on JET and prepare to leave, you will still be responsible for paying the taxes before you go. This can be over 150,000 yen, and depending on how your CO handles your tax situation, you may be asked to pay it all in one installment before you go. Make sure to check with your CO how you will pay your taxes! For more information on the American Tax exemption and all the necessary stuff to do for that, please visit the amazingly helpful Kumamoto AJET site, which has all the documents and info you could need. Even though you should not have to pay taxes in your home country for your JET salary, you will still have to file a tax return. Confirm how to do this with your home country’s tax agency.